You should think twice about your off-roading outdoors adventure vehicle, because it would seem that an old VW T3 is all you really need. 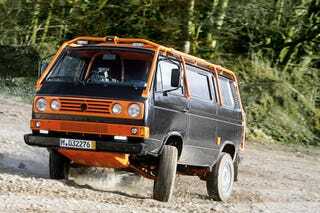 This T3 has been outfitted with off-roading wheels (compared to the inflatable inner tubes on the stock T3), a safety-jacket orange paint job to distinguish the van from a bear for hunters and enough gadgets and gear to do damn near anything. It's loaded with gadgets of all types including multiple computers, cameras everywhere, flat panel displays, DVD players, 600-watt surround sound system, GPS gear and more. The roof of the T3 has a couple solar panels to provide some juice alongside large supplemental batteries.